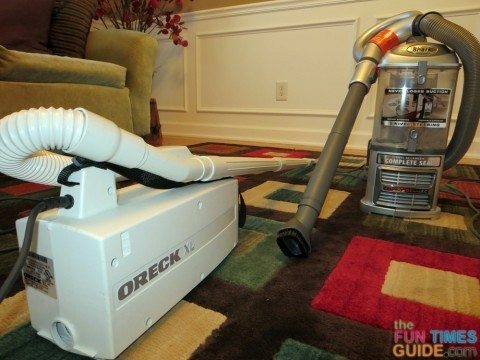 I’ve used an Oreck vacuum cleaner for the past 13 years. I’ve been quite happy with it. Mostly, I like how lightweight it is — only 8 pounds! And I never doubted that my carpets were getting clean… until now. Recently, Costco had a special sale price on a Shark Navigator vacuum. I don’t mind paying for quality. But for as long as I’ve been compiling this list (at least 2 or 3 years), I’ve never been able to convince myself that $400 or $500 for a Dyson was worth it. 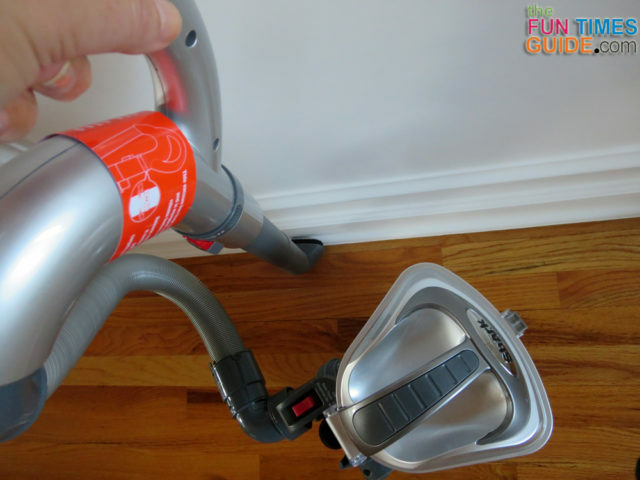 Since I could get the Shark Navigator Lift-Away for just over $100, I did a good bit of research on this vacuum and almost immediately decided it was the right vacuum cleaner for me. 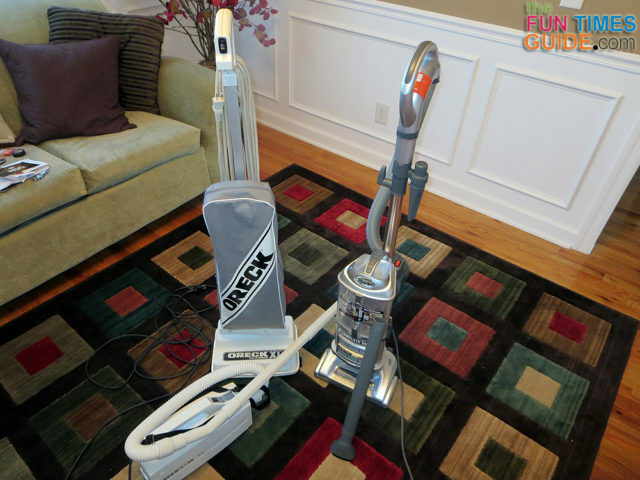 As soon as I brought the Shark Navigator vacuum home, I did as they always recommend when comparing 2 vacuum cleaners — I cleaned my carpets and rugs with my old vacuum cleaner first (the Oreck XL). Then, I immediately cleaned the exact same areas with my new vacuum cleaner: the Shark Navigator Lift Away. The dirt you see here is what I took out of the garbage pail after I had emptied the Shark Navigator’s canister a total of 7 times while cleaning each room in my house. Of course, I can’t show you what my Oreck picked up on its pass of the same areas — because that’s all contained in a vacuum bag. 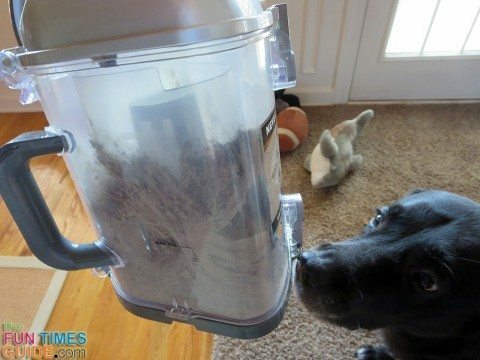 But the fact that so much pet hair (I have a Black Lab), dirt (I never imagined my carpets were this dirty! ), dust (I like how much of the really fine stuff gets picked up), and other debris (mostly food crumbs and shredded paper scraps) was picked up by the Shark Navigator AFTER I had already used the Oreck on those same places just shocks me! There is no doubt that I made the right decision to retire my Oreck. My new new Shark Navigator Lift Away clearly picks up SO much more than the Oreck every could. 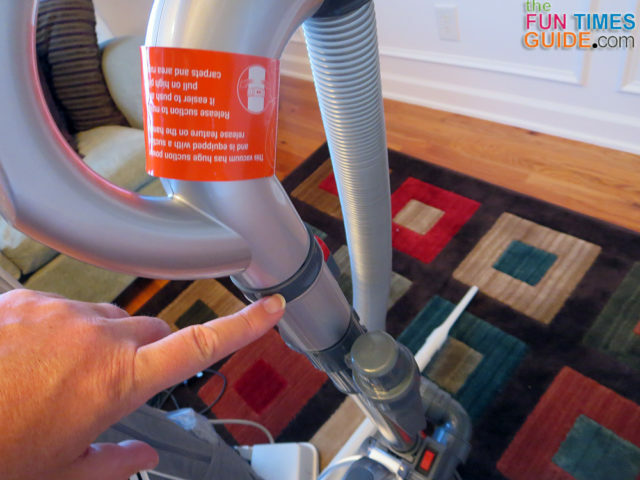 Here’s a point-by-point rundown — the things I like about the Shark Navigator vacuum, and the things that I don’t like so much. So you can make your own conclusion as to whether the Shark Navigator Lift Away is the right vacuum cleaner for you. The suction power is amazing! This is its #1 most positive feature. It has a super-long cord — 35 foot! I appreciate this more than I thought I would. I’m no longer limited to vacuuming only one room at a time. I can pretty much do my entire downstairs without unplugging. The floor brush head itself gets farther underneath furniture than my previous vacuum did. This due to the fact that the nose of the floor brush has a thinner profile that comfortably fits under the edges of furniture that’s very low to the ground. Everything swivels! From the main floor brush head (used to clean all floor surfaces) to the dusting brush attachment (used to clean baseboards, lamps, and blinds). You don’t realize how nice this is until you’ve used the Shark Navigator for awhile. Then you realize how easy it was to clean things, thanks to the swivel factor. I’ve never used a ball-technology vacuum cleaner before. I’m very happy with the way this one swivels and glides on all floor surfaces — around furniture or not. I’ve used plenty of vacuum attachments in the past. But the swiveling dusting brush attachment — combined with the super-powerful suction — is great for cleaning lamp shades, throw pillows, window blinds, curtains, baseboards, mirrors, and picture frames! The canister/bin is relatively easy to empty (even with one hand – yay). However, there are a few downsides to this. See below. The ability to control the suction power is nice. This applies whether you’re using the floor brush head for regular vacuuming or the hand wand with attachments. It’s nice because you can immediately stop a rug from being sucked up into the floor brush head, or lessen the suction power when using the hand wand on smaller/more delicate items. This is controlled using a rotating collar high up on the vacuum handle. It comes with the 3 most important attachments: dusting brush, crevice tool, and small power brush (for pet hair and ground in dirt on carpeted stairs and upholstery). There’s also a (rather short) extension wand. Only the dusting brush and crevice tool can be stored on-board at all times. I actually keep the brush inserted into the extension wand at all times – and keep it in the on-board holder like that. It’s a little awkward, but works for me. It’s quieter than I thought it would be. It’s definitely quieter than my old Oreck vacuum. The plastic extension wand, handle, and attachments are made of a softer, yet more durable plastic than my old vacuum. If dropped on the floor (yes, even the heavy handle with extension wand and brush attachment… take it from me), they’re less likely to crack or break than the more brittle plastic pieces from my older vacuum. The rear wheels under the floor brush head roll VERY easily over all surfaces — from carpet to hardwood to tile. This is true while vacuuming or while you’re just rolling it from one room to another. This is a surprising benefit, as I’m always a little leary about scratching my hardwood floors with ‘plastic’ things… like wheels. It’s easy to clean the stairs with the lightweight liftaway canister alone — whether those stairs are carpeted or not. There’s a power brush attachment that they advertise works great on carpeted stair risers, but my stairs aren’t carpeted so I just use the regular dusting brush or the crevice tool to gulp up all the pet hair that gets left behind on the stairs. For the record, that power brush attachment works great on upholstered furniture though — especially if you’ve got pet hair on your furniture! The liftaway canister makes it simple to clean the interior of your car (…and the felt liner inside the tour pack and saddlebags on our motorcycle). The Shark Navigator Lift Away uses Anti-Allergen Complete Seal Technology that traps over 99.9% of dust and allergens inside the vacuum. It’s not something you can see… or measure yourself… but I like it! I wish the hose was longer. Ideally, it would be a slightly thinner, more compact hose that stretches very very long when extended — that way, your arm wouldn’t get fatigued while reaching in high places as you use it. Instead, it’s a rather thick/heavy hose (which is good for quality I guess) but it doesn’t stretch very long — it’s just long enough to reach the top of my window blinds. And that’s when using 2 hands, because the hose is kinda heavy and doesn’t have much “give” to it. The cord gets in the way a lot — not because it’s so long, but because the part where it comes out of the base of the vacuum is way down low. If it was higher up on the handle, it would be closer to my hands where I could easily work with it. In fact, there’s a little “cord clip” hook which was probably intended to help keep the cord out of the way, but the cord constantly slips out of that hook so it’s rather useless. It could use a better cord management system. Yes, it’s an “extended reach” model, but if you use the extension part they’re talking about (the long metal part that connects the floor brush head with the vacuum handle) it’s really heavy — so it’s difficult to use the extended wand for very long without your arm getting tired of holding it. And who really wants to use 2 hands to maneuver a vacuum cleaner extension wand? Instead, I prefer to use the “regular reach” with the simple extension wand attachment connected to the dust brush — all stuck into the short (lightweight) end of the handle. It’s kinda hard to explain. 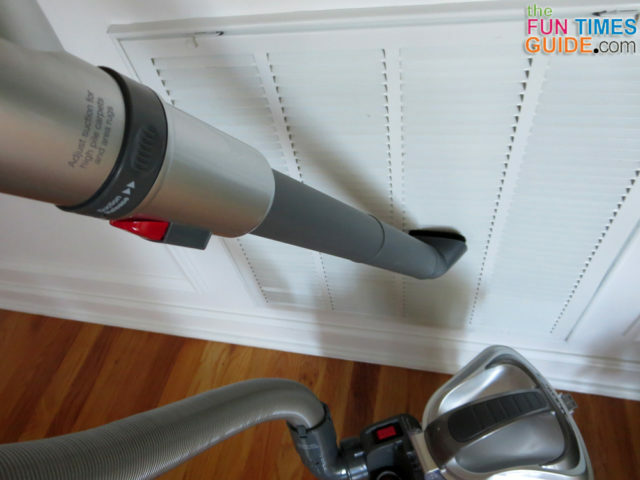 While you can lay the handle down — almost on the ground — to clean under furniture, you have to be careful when pulling the vacuum back out of those spaces. The reason: the canister latch (that’s used to empty the bin) is unfortunately placed right where it will “catch” on furniture if you’re not careful. Having to be so careful not to bump that latch kind of defeats the purpose. It’s no longer so convenient being able to clean underneath furniture. It’s pretty much a 2-handed process to use the handle/wand to clean anything. This is due to the powerful suction, combined with a slightly handle that becomes slightly heavy after using it more than a minute or so. Emptying the bin is not as simple as opening the canister latch and letting everything fall out. There is one tight corner inside the bin that always — yes always — holds onto a good amount of dog fur and debris. So you have to bang lightly on the side of the canister each time in order to get the stuff to dislodge itself from that one area. Sometimes, it’s stuck so tightly I have to actually stick my hand up in there to dislodge it. While it’s all dry dirt, it is dirt… so that’s not fun. I’m kind of a neat freak (but not a germaphobe). So I plan to clean the 2 main filters rather often — probably more than every 3 months, as recommended. The only downside to this is the fact that doing so will always be a 2-day project, because you have to let the filters air dry completely — at least 24 hours, according to the manual. This is slightly trivial, but still a downside in my opinion. There is a great deal of hot air coming out the front of the vacuum itself — near the HEPA filter area. This is true when it’s being used as a floor cleaner or as a handheld canister. It’s probably a necessary evil when you have so much suction power, but when you’re in a small room — like a bathroom or closet — it gets hot in there rather quickly. And when you’re already sweaty from cleaning anyway, you don’t want any added heat near you. I wish the on/off button was on the handle (up high, and where your hand always is). Instead, you have to keep bending down low to reach the button in the middle of the vacuum to switch from on/off or brush roller on/off. There are no headlights. But how often do you vacuum at night — or in places where you literally need headlights to guide you? To be honest, any light that shines from a vacuum head isn’t likely to be bright enough to make any real difference in your ability to move toward the dirt or its ability to clean anyway. If I ever did buy a vacuum cleaner with headlights, I would want them to be super-bright HID lights… or no lights at all. The see-thru bin always looks dirty, even when it’s just been emptied. That’s because it’s clear and the very fine dirt/dust particles are a light brown color that tends to stick to the sides of the bin. For clean-freaks, this just seems contradictory: the vacuum is great at giving you a clean house, but at the same time the vacuum always presents itself as a yucky tool when you grab it from the closet. On the other hand, being able to see the dirt, debris, and dog fur collecting in the bin as you’re using it is motivating — if not rewarding. 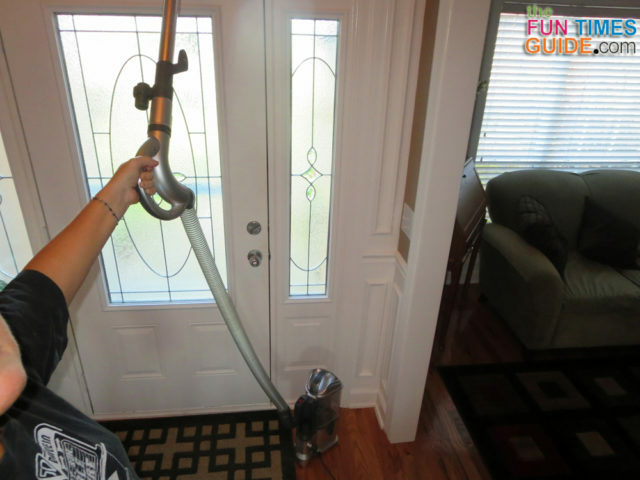 It’s a good feeling knowing that you’re removing all of that gunk from your home! This vacuum cleaner is heavier than I thought it would be (16 lbs). Even though that’s twice the weight of my old Oreck, it’s actually not too heavy. And it moves like a sleek lightweight vacuum, gliding really easily over all surfaces — from carpet to tile to hardwood flooring. I especially like that the rear wheels seem to have a “soft” coating on them that makes them glide better over my hardwood floors than hard plastic wheels typically do. I’ve found that the suction is better from the front/nose of the floor brush than on the sides. Having great pick-up power from the front of the vacuum is a good thing, but I thought the sides would have greater suction as well. Said another way: one pass with this vacuum will pick up most things with ease — unless those things are on the outside edges of the cleaning path. While definitely not a problem, the one item I’ve found it to have the most difficulty with (if I had to pick one) is shredded paper. My husband’s office floor is littered with tiny bits of paper from emptying the paper shredder. It took the Shark Navigator a few extra passes to pick it all up. Still, the Shark Navigator vacuum picks it up much better than my Oreck did. The small brush attachment is really handy and I use it a lot. However, it would be even nicer if the brush bristles on this attachment were a little bit longer. That way, the hard plastic part of the brush attachment would be less likely to bump/scratch baseboards, hardwood floors, etc. You have to physically step hard on top of the floor brush head in order to recline the handle and begin using the vacuum. I wish it were a little easier to do that with my hand alone, as with my last vacuum cleaner. However, I guess I appreciate the fact that using your foot first makes you keenly aware of the fact that you’re about to use the rotating brush head on the floor (a good reminder in case you’re on hardwood flooring). You see, when the handle is in its upright position, the floor brush head doesn’t rotate at all. On the side of the floor brush head, there’s a light that illuminates green when the brush is rotating or red if there’s a blockage. I sucked up part of a plush dog toy once. It wouldn’t let go until I turned the vacuum off. Even then, thanks to the powerful suction and powerful rotating brush head, it took some serious prying to dislodge the toy. No harm done though. Many of today’s modern vacuums (mostly bagless vacuums, including the Dyson) brag about there being no cost of use after you bring it home. I assumed this would also be the case with the Shark Navigator Lift Away. Well, sort of. While there aren’t any replacement parts necessary, per se. There are 2 filters that need to be cleaned regularly and 1 that needs to be cleaned semi-regularly. I don’t mind cleaning filters, but you can bet there will come a time when I’d rather replace a dirty old filter than keep cleaning it — thus, a future cost of ownership. Plus, there are 2 other items that they refer to briefly, yet they don’t talk about cleaning or replacing them: 1) Under the section entitled “Emptying The Dust Cup” they mention that debris might be stuck to the Screen Filter inside the dust cup. It seems to me that this filter — which sits right in all the dirt & debris inside the canister itself — would need to be cleaned and/or replaced at some point; and 2) Under the section entitled “Troubleshooting Blockages” they mention a Lifetime Belt that powers the motorized floor brush. Clearly, this could need to be replaced at some point, right? While I’m not crazy about having to remember to clean 2 of the 3 filters regularly (every 3 months), it’s not a bad price to pay to eliminate having to buy replacement vacuum cleaner bags all the time. One of them, the Pre-Motor Foam Filter, is the first line of defense in this bagless system. It was perfectly white, but turned brown after the first time I used the vacuum. After cleaning my entire house for the first time with the Shark Navigator, the build-up of fine dirt particles was seriously accumulating inside that piece of foam. (FYI, it’s JUST like the foam that’s used in high-quality foam bed mattresses.) I was eager to clean it, but decided that my “routine” would be to clean it every 3 months as stated OR as soon as I saw the dirt/dust was making its way to the next filter: the Pre-Motor Felt Filter. Both of these filters sit below the canister — between the hose and the lift-away bin itself. For the record, the Post-Motor HEPA Filter has a larger, open weave and only needs to be cleaned every 2 years. After the second time I used the Shark Navigator, my inner neat-freak got the best of me and I decided to clean the Pre-Motor Foam Filter and bring it back to like-new condition. Just take off the lift-away canister, and remove the thick foam filter that the canister was resting on. Rinse thoroughly with water until it is no longer brown and looks white — like new — again. Squeeze all water from the foam filter and let it completely air-dry for at least 24 hours. Put the (completely dry) foam filter back underneath the lift-away canister before using the vacuum cleaner again. As I said, the only downside to this process is the fact that the vacuum cleaner cannot be used for 2 days — until the foam filter has completely dried. And that means your vacuum cleaner has to sit somewhere — with the canister separated from its base — until you can put the clean foam filter back in. Fortunately, I have a large utility closet, so it’s hidden out of the way. But for many, the vacuum might be “in the way” a bit during the filter cleaning phase. For what it’s worth, my Shark Navigator Lift-Away is the Deluxe model “with extended reach”. (It’s not the Pro model or the Regular model.) It’s model #UV440, but all of the replacement parts and filters I’ve found refer to model #NV440. Best I can tell, it’s identical in all ways to the NV model — so that’s what I use when I’m buying the Shark Navigator Lift Away replacement foam & felt filters (Part #XFF350) and Shark Navigator Lift Away replacement HEPA filters (Part #XHF350). The part numbers are straight from my user’s manual. The Shark Navigator Lift Away ROCKS! 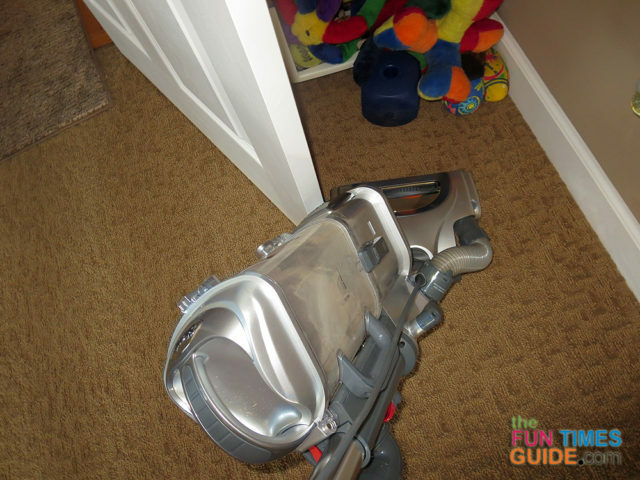 In the end, my house is cleaner than ever thanks to the Shark Navigator Lift Away vacuum. Especially for the price (compared to a Dyson), it’s a great machine and I’m thrilled that I have it. It even makes places that I rarely touch an absolute breeze to clean now — like baseboards, window blinds, lamp shades, and our jetted tub. Wait — jetted tub? Yep. Seriously. We have a large, jetted tub in our master bathroom that we rarely use. Quite honestly, it just collects dust. It’s a chore to clean all the nooks and crannies — because once you use a damp cloth, the dust just spreads and ends up in lots of little clumps. It takes far more work to clean than it’s worth. Since our jetted tub basically just needs “dusted”… I can now use the Shark Navigator with the lift-away canister, extension wand, and dust brush attachment. My tub is spotless again — and now it’s easy to keep it looking that way! 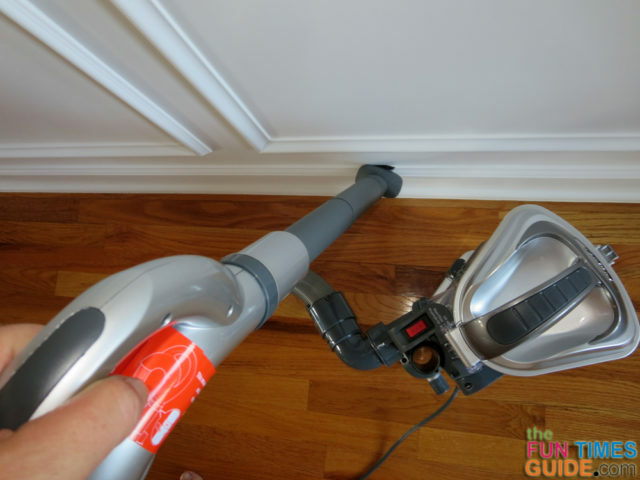 Baseboards, lamp shades, and window blinds all make more sense, but even there I couldn’t believe how incredibly easy those areas are to clean now using the Shark Navigator. I attribute this to the powerful suction, combined with the soft dust brush attachment and extension wand.